Wilderness lands of Minnesota and Ontario - the Superior National Forest, Quetico Park, Woodland Caribou Park, Wabakimi, Killarney and Algonquin Provincial Park were formed long ago. They waited as continents drifted, as glaciers advanced and retreated, as early people hunted and left their cryptic paintings on billion year old rock. These primitive and challenging lands wait now for those that would travel by canoe. Here at the canoestories web site you can read stories from these lands, from the canoe country of North America. These stories are free and complete, written by the people that actually made the trips described. A trip to Killarney Provincial Park, exploring its unspoiled eastern and northeastern wilderness sectors and hiking to the top of Silver Peak of the renowned La Cloche Mountain Range. Norm Hooper and Wayne Morrison take a trip to the top of Silver Peak. Great canoeing and great photos make Norm's journal a great read. "Every die-heart canoeist has in their blood a desire for a more adventurous and challenging waterway that would surpass their last trip." And few are as challenging and beautiful as Killarney Provincial Park, considered a crown jewel of the Ontario wilderness parks system. Join Norm Hooper and his canoeing buddies for some great canoeing and great scenery in a majestic landscape. There is only one achievement so remarkable that even the most sophisticated machine cannot pretend to have accomplished it, and that achievement is conscious experience. The greatest achievement of the human brain is its ability to imagine objects and episodes that do not exist in the realm of the real, and it is this ability that allows us to think about the future. The human being is the only “animal” that thinks about the future. We think about the future in a way that no other animal can, does, or ever has, and this simple, ubiquitous, ordinary act is the defining feature of our humanity. A new location in Canada. I garnered information about Wabakimi at Canoecopoia in Madison, Wisconsin in March 2010. I met with”uncle” Phil Cotton (the Wabakimi Project) and conversed with him in April to get information on a possible route. It gets easier to prepare for each solo. This is year three. Gear, food, clothing and shelter remain constant. There were a lot more logistics to organize for this trip… much more dependency on outside parties. Wabakimi project maps (to supplement the topos), Canadian Railroad arrangements to store the canoe and gear in a boxcar, permits and fishing license….. but it all came together. At the northern edge of Lake Couchiching, the Trent-Severn Waterway continues its north-westerly journey down to Georgian Bay. The route follows the Severn River as central Ontario farmland gives way to the granite outcroppings of the Canadian Shield. The much-tamed Severn forms a magnificent cruising link in the chain of rivers, lakes and canal cuts which join the waters of Georgian Bay to Lake Ontario. Join Norm and Wayne as they travel and photograph this beautiful and interesting system of locks and lifts. "We let our canoes drift, suspended in a surreal calm, as three turkey vultures silently soared among the air currents. The roar of Blue Chute Rapids could be heard in the approaching distance..."
The Time We Crashed The Car by Mike Kelland New! A canoe trip requiring a mid-week shuttle to change partners, a first-time camper, a heavy borrowed canoe, packing on the trip up..... nothing of concern here if you're 18 years old. Paddles that break, a flat tire, a near-tragic van-totaling crash... nothing that can't be fixed by youthful resillience and understanding parents. Adventure comes in many ways - and when three or four of those ways happen on one trip, it makes for a great story. This is one you gotta read! Join Norm on an excellent adventure into the Kiosk area of Algonquin Park, Canada. Norm and his three companions traveled through seventeen lakes including Little Mink, Whitebirch, Clearwater, Club, Mouse, Mink Creek, Big Thunder, Erables, Maple, Ratrap, Dalinda, Boggy, North Sylvia, Three Miles and Manitou with a return through the Amable du Fond River and across Kioskkokwi Lake. For Norm Hooper, retirement is a time to lean back, lift up your feet and... slide down with the cascading current of a natural water slide in Algonquin Provincial Park! Norm's story takes you through the beautiful High Falls and Barron Canyon regions of the park. So lean back, lift up your feet and slide into Norm's story of canoeing, hiking and high speed swimming. Join Norm Hooper on his second trip into Algonquin Park. From Cedar Lake to Mink Lake, Norm's trio of travelers paddle and portage through the rugged and beautiful forest land just a few miles north of Lake Ontario. Norm's great pictures and vivid descriptions make this an excellent story. Norm Hooper's September trip into algonquin provincial park passed through days of sunshine, days of rain, wide waters filled with wind and waves and glassy lakes touched with early morning mist. Let Norm and his paddling companions show you why Algonquin Park is one of Ontario's favorite paddling destinations. It's spring, and the fish are biting in Algonquin Park! If you like a good story about fishing - a secret fishing hole, cutting a path through a wilderness stream, a rapids full of brook trout - this one is for you. A 'Once Upon a Time' Bloodvein Tale by Jerry Ameis A 1969 trip with a dead end & an unexpected event. "The Bloodvein is one of those rivers that captures one's imagination. Perhaps it is the name. Perhaps it is the challenge of reaching its upper waters. Perhaps it is the connection to the fur trade..". If you ever wondered what it was like to travel in Woodland Caribou Park long before portage crews and accurate maps, when your gumption and resolve was the only way to make it to the next lake, then you must read Jerrys well-illustrated adventure story. A Family Adventure from Mexican Hat to Tulabi by Jerry Ameis If only all people pondering marriage would take an 8-day canoe trip into Woodland Caribou Park... Well, maybe not always a good idea, but it seemed to work out for Jerry Years later it led to a family trip that Jerry describes in this story. "We were in the proverbial middle of nowhere with no one around in case we got into trouble. The moment passed as we paddled towards the campsite. The pleasure of gliding through the water, the beauty of Mexican Hat, the challenge of canoeing to Tulabi, and the novelty of the situation captured our imaginations and lifted our spirits." Wallace Lake to the Bloodvein River by Jerry Ameis Canoe travelers quickly learn that less "stuff" makes for a better trip. (Some of us even say less stuff and less company makes for a better trip!). But any trip into Woodland Caribou Park usually turns out well and Jerry describes just such a trip. by Jerry Ameis Jerry takes us back to 1989 on a trip that went north to reach a lake that was south of the launch point. "The Talon River is misnamed. It might better be called a creek, but it does have character. As you get close to Talon Lake, from downstream, the river becomes sandy-bottomed and gives you the feeling that you can pan for gold in the clear shallow waters." A Long Ago Irregular Lake Trip by Jerry Ameis Jerry explains exploring as it was forty years ago when maps were fuzzy and GPS might have meant God Please Show us the way. "In those days (1971), the Bird (River) system was as much a wilderness zone as were more remote and exotic places such as the Churchill River of northern Manitoba... Today, this area is part of Woodland Caribou park." As usual, Jerry gives us maps that show the routes covered. The Artery to Bird Fiasco by Jerry Ameis "By late evening we arrived at what could be called crossroads lake. It was the lake that I reached 20 years ago by portaging from Royd Creek (upstream from Royd Lake). There were no campsites of the kind you see in wilderness promotions. We did manage to scratch out a tent spot in a hollow on a rocky island. After a hasty supper, we crawled into the tent, anxious about what we hoped to find in the morning - the two portages of 20 years ago..."
Woodland Caribou Solo 2 by Mike Kinziger "It was quiet this morning. How quiet? The lake was a mirror. A foggy mist rose slowly from the bays and marshes. There were no loons, no wind, no bird sounds. When the sun peeked out over the horizon, I expected the day to come alive. It didn’t! It was peaceful. I wanted to stay in that moment for as long as possible. There is a feeling that overwhelms me when I sit looking over a wilderness lake. Tranquility. Escape. Satisfaction. A person just doesn’t get to a place like this without all of the planning and work. But here I am. Mesmerized. Happy. Smiling out loud! " 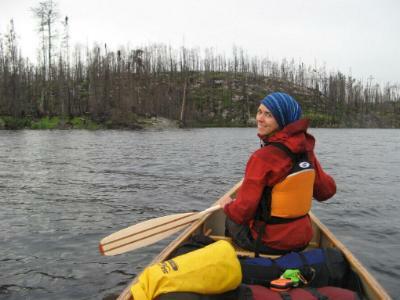 21 Days in Woodland Caribou Park by Tyler Rudolph and Jacynthe Guimond This report documents a 21-day canoe trip onto Woodland Caribou Provincial Park from the Wallace Lake access point.... Emphasis is placed on a previously undocumented canoe route from North Dunstan Lake to Carroll Lake via Walking Stick Lake.... Reference maps...portage and campsite descriptions...wildlife sightings and other observations offer new information about the new route. Five Weeks by Mike Kinziger A perfect September morn....I sat by the fire warming but realized that the only sounds on this calm morning resonated from the crackling wood of the burning wood. With coffee and chair, I moved to the end of my peninsula and sipped and listened. Can one tire of the song of the loon? Or can one not be tempted to pick up the fishing rod when fish rise in the glassy water? Do people ever just watch and listen to flocks of geese as they migrate? Can you hear the sun rise? I know you can feel it. There is a more permanent warmth that comes from the sun then from a fire or hot drink. Last evening in the twilight, a bull woodland caribou began the seasonal ritual of looking for mates with a bugling that went on for at least an hour. I could see him on the tip of another peninsula about 100 meters away. He thrashed and called and even splashed in the water. It was quite a performance. How fortunate to be able to experience these types of phenomenon’s. Stepping off the path, exploring new routes, traveling alone and seeing no one for weeks - this is the ultimate adventure for a lake canoe traveler. Martin Kehoe takes us on his 32 day trip to the interior of Woodland Caribou Park. "The creek below this looked wide and open for travel so I worked back up the shoreline in search of a better option than all the dense trees. Pushing aside some Alder and Maple brush I found myself staring into a slot canyon in the high rock. Walking on in awe through the dark and cool passage led me to the spot from which I had retreated minutes earlier." Martin explores areas of the park rarely traveled on this thirty day trip. "Tomorrow the real adventure begins. If I can get down Gammon Lake and through the little Upper Gammon Lake there is a creek that heads north...."
Woodland-Caribou 7 Day Canoe Trip Journal by Al Bayne and Tim Gosselin Travel with Al on a trip from the Leano entry point to Paull Lake in the southern part of Woodland Caribou Park "The sky is blue, a light breeze is blowing, and we have a 4 km paddle before we encounter another portage – life is good." "After a few days in the bush, especially on the fifth or sixth trip of the season, the relaxation and absorption into the trail life can become so complete that the other life, in the city, fades. Wood, water, gear, trails: that’s life." Travel with Martin through the Wanipigow, down to the fire cleared shores of Irregular Lake. Explore an old trail on the Royd - Murdock route and ride with the wind up to Musclow. After all this traveling, ending with the Artery - Ford portages, Martin pauses to map out the Siderock - Obukowin portages. If you're a canoe traveler, you'll want to read this great journal. "The Stranger imagined himself crushed by his boat as they tumbled together down the chute. As his head went under, he looked up at the bottom of the boat. He could see the daylight through it." "Sometimes our path leads us closer and closer to fast water that shouts, then roars as it runs wild over the land, throwing spray into the air, seeming to shake the treetops with its power. 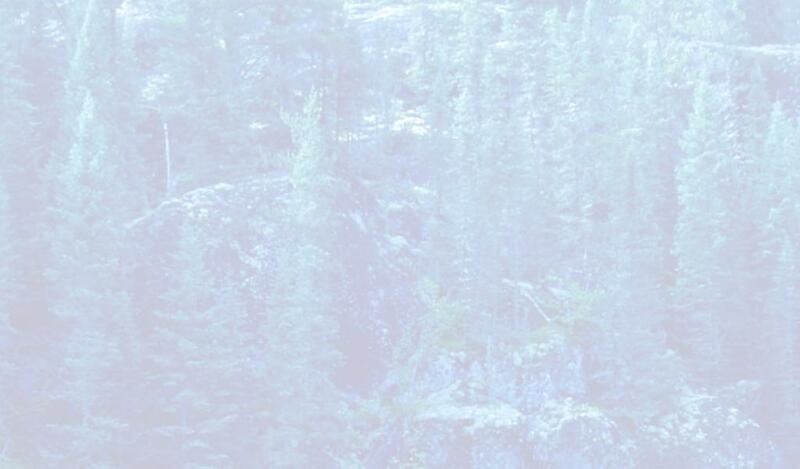 Sunlight pours down from above, tumbling through the high branches and splashing on the forest floor." "How about traveling from the north boundary to the south boundary of Woodland Caribou? Yes that would be it! We would travel in one of the most beautiful quadrants of the Little North in the Canadian Shield. North of the Bloodvein to south of the Bird." "Like a Freight Train it hit us. We got out in a blinding rain to put the fly on the tent, got back in and were hit by a hammer that flattened the tent. I was awed at how fragile our shelter was; our shelter that we took for granted as safe and secure. Flattened. I sat up against the wall to hold it up. The wind raged and the rain pummeled us. Things in camp blew around. Lightening hit a tree on our island but the forest couldn’t catch fire because it was raining so hard." "...the Chief and I let the fire go out and stared into a completely moonless night sky full of stars. As our eyes got adjusted to the darkness, you could see the black areas in the sky where there were no stars. We spotted dozens of meteors shooting across the sky and then the Aurora Borealis started displaying their colour. All in all it was a spectacular sight... I'm glad we enjoyed the sky that night because it would be the last star we would see for the rest of the trip. "I sat up late that night on a rock down near the river, with rapids on both sides, and looked and listened, for hours. Unworldly voices whispered in the mist, speaking of those who had passed this way before and those who may come later. I said a prayer and dropped some tobacco into the stream. 'May all who pass this way be well and happy, and may they be respectful, for they are on sacred ground.'" "There are watershed events in life that change everything ever after. My first one was probably when I opened my business...that saved me from ever working for someone other than myself... The next one was when the Commander walked into my store on a slow day in the summer of 1980. That changed everything. I became a camper. That's how it all began." "... We stopped on a gem of an island that had a fire pit with a three foot tree growing in the coal bed; that’s how long ago it had been used." "...as the evening closed in, they set the fire on the beach, moved a woodland bench over and sat watching the sunset and moonrise together... Talon was a sheet of glass... Just the fire, that long beach and long sunset, then the stars. Perfect." If you enjoy watching a bear foraging for food, enjoy hitting that great lake trout spot or enjoy watching a bull moose following a cow and calf on a small island, you'll really enjoy Martin's latest Woodland Caribou Park story. Martin's group of four flew to Royd Lake and fished through the fifteen portages to Murdock Lake. Come along now, then start thinking of your own trip to this great wilderness area. Martin takes you to another western entry point to the park. By using the Garner Lake entry "You will be rewarded with little contact with other canoeists, fantastic fishing and the chance to travel remote backcountry and still have maintained portages. Do it once and it will be your destination of choice for great canoeing." Mel and Walt take you to a great pickerel (walleye) lake in the south central part of the park. As they describe in their journal: "We had caught 14 walleye and 4 pike in our morning's fishing..." The best part is that they released almost all of the fish they caught. The fish are still out there! Join Mel and Walt in some fishing, a few portages and a liter of chowder at their campsite below the falls. The Wanipigow River can take you from Wallace Lake in Manitoba to the Crystal Lake entry point of Woodland Caribou Park. This seldom-used part of the park offers traveling adventure, good campsites and some great views of the land. Martin's journal contains great information about a canoe trip through this great route. May can be a challenging time in Woodland Caribou Park. Martin traveled through hot, sunny days, woke up to sleet and snow, and crossed open lakes of numbing cold water. His canoe journal takes you to the interior of the northern half of Woodland Caribou Park - to lakes and streams not often seen. Martin's excellent canoe journal will take you to these lonely lands, to places perfect for those seeking adventure and solitude. North of Red Lake, the Chukuni River becomes narrow and shallow - perfect for canoeing! The "last stop" of the Chukuni leads you right to the doorstep of Woodland Caribou Park, another perfect canoeing destination. Open, mature forest, big lakes, solitude and great fishing greet the canoe traveler on this route. Travel north from the boundary waters to Red Lake Ontario, and you'll find another wilderness park. Woodland Caribou Park is only six hours of scenic driving from the international border. The wilderness of woodland caribou is an exciting place, much like quetico was forty years ago. ...a loud guttural growl comes out of the woods and I freeze in my tracks! The Leano Lake entry point is a favorite for canoeists entering woodland caribou provincial park. It's only the beginning - the portages and lakes stretch all the way to the Manitoba border. Slow, narrow channels change to wide and deep waters. Open mature forest changes to land scrubbed clean by fire. All of these places are waiting within Woodland Caribou Park. Pick up your paddle and discover a new place for canoe travelers, an unspoiled land of solitude and beauty. "We got lost, we fought winds and waves... near froze one morning on Moose Lake and ran rapids, climbed Devil's Cascade, trekked to Johnson Falls, relived the steps of a ranger's recordings , visited pictographs and sat out many an evening by a smoldering camp fire... swapping memories and lies and pitying the poor souls that would never know what was to be experienced in this serene rugged land." Patrick Doty and his group of young men launch their canoes into the darkness of a wilderness night. The night travelers paddle and portage to one more day and a memory that will last all of their days. "I look down to my right and see the ripples from my paddle shake the reflection of the moon and what was left of the stars in the sky..."
From his remote cabin just south of the Ontario - Minnesota border, Martin writes of an encounter with a wolf pack. "When the big wolf stared at me I felt the game was up and I was waiting to see how he was going to alert the others." "We are heading for the fabled "Table Rock," camping site of voyageurs - often mentioned in 18th century fur trade journels - with a history, even among whites, older than any edifice of man within hundreds of miles. A perfect camping spot - doubtless its significance among the Ojibwe, Sioux and Cree - goes back much further." "I grabbed my other little flash light and tried looking in the direction of the noise but I couldn’t see anything. Now the crashing noises seem to be in slow motion as it just kept coming forward...."
"This was my 20th canoe trip to White Otter Castle. It is a great place because there is a lot to do and see. The routes in, offer a variety of the best of the Canadian Shield. Plus the scenery is spectacular, and the extended beaches are pristine, and you usually have them to yourself. The route we took this year is the same one I used when I taught Wilderness Leadership, and it is the same one I took my family on 8 years ago and featured in my book, 'Bugs, Sweat, and Fears'." From Batchawaung to Cache Bay, join Chris and Mike as they paddle across Ontario's Quetico Park in just two and a half days. Chris takes you through the land, introduces you to the people they meet along the way and gives you the memories that make each trip to the wilderness better than the one before. There are odd things in the boundary waters canoe area, sights and sounds foreign and strange. "My hand reaches for the zipper. Something jumps right onto the screen and I flinch back!" "The northern shore comes into view, and we suddenly realize how devastating the Bird Lake fire was. There's a feeling you get when winter is coming; an empty feeling as the green goes out of the land..."
The boundary waters have a way of drawing you back. Harold Rutan tells about his return after being away more than twenty years. His canoe trip takes him and his stepson from Clay lake in Northeast quetico to Basswood on the American side of the bwca. "As I opened my eyes in the morning...I recall being astonished when I thought of how we had gone from one of the most densely populated areas on the planet to being deep in the wilderness." "The canoe slammed into another rock, then slid down a chute and took on water. She thought they would die. They were swept around the bend, and then Zora saw the bears..."
A short story about a a traveling companion who has a wonderful canoe trip, despite the shortcomings of his clumsy master. Dale gives us a viewpoint that may enhance your next trip into the boundary waters. Superior trails is an online travel, hiking, camping, and canoeing guide for the Lake Superior area. "As I peeked out of the tent screen, I had to rub my waking eyes. This was not a dream: this was snow; we were here for a canoe trip; and it was July 1st, 2001. We would be traveling the Missinaibi River flowing into the Moose River..."
Did you ever wonder what it's like to paddle through the cold fast rivers of northern Manitoba and Ontario? Click on the "Photo Albums and Trip Logs" link of the Camp Chippewa site to join them on the Seal River, the Little Churchill River and the Bloodvein River. Seals, artic grayling, whales and polar bear - all are possible and many are seen and described as each adventurer writes of his experience. Phillip Kenney and the frog cover a lot of territory - canoeing in Red Lake, Ontario, Algonquin Provincial Park, the Spanish River, the Potomac River, the Shenandoah... Or, if you prefer, join them on the Appalachian Trail in February. Visit Phillip's tips and tricks page and pick up a new idea to try on your next trip. Shipp has some great trip stories. Be sure to travel with Shipp "Up a Lazy River" in the Boundary Waters Canoe Area Wilderness and through the Kisaralik River in southwest Alaska. Read about his trip to Woodland Caribou Provincial Park. Besides giving you helpful information and resources, Shipp gives you plenty of reasons why it's great to take a wilderness canoe trip. Information about the hiking through the Superior National Forest in the bwca. The story of a bicycle trip across the state of Wisconsin. Products for the open fire cooking experience. A blend of fun and practical cooking usefulness.